Anemonopsis, a member of the Buttercup family, Rananculaceae, is a hardy herbaceous perennial with anemone like blooms of pale lilac in summer. 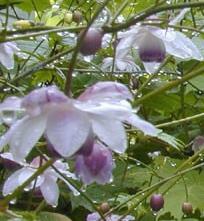 Native to Japan, it is adapted well for woodland or shade gardens. The plants thrive in moist light well drained soil in a shady location. Anemonopsis plants are slow to reach maturity, and bloom after about 5 years. The plants may be propagated by sowing seed or by dividing existing plants. Seeds should be sown in autumn or early spring and allowed to naturally stratify. If planted later, seeds may be artificially cold stratified. See Cold Stratification for further information on stratification. When planting out of doors, plants should be set at a spacing of 18-24 inches apart each way. Hardy to -30F (-34.4C) Height: 30 inches Spread 24 inches.